It’s a Winter Village Life, and the Strength of an Ox. The snow is coming down quite heavy these last two days. The snow we had prior melted and now fresh new white semi-wet snow landed. I have always liked snow days, just based on a change of lifestyle from the summer. 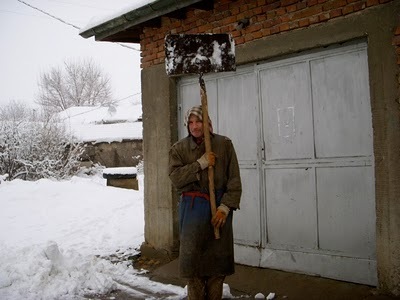 This is my neighbor, he let me use his big homemade shovel. He is kind of a strange type of guy, but I can say one thing is he stronger than an Ox. One day last summer he came over and started to cut the weeds in the big yard with a large grass sickle, and that was a Wow. I can say that my immediate neighbors are very helpful, but somewhat noisy. I am kind of pulled in each direction for this summer. I would like to stay and waste away here in the village, but I will head out in April, I have a few tentative plans, but I do know I will be driving my car if it holds up. NYC just got blanket with a few inches of snow but it looks nothing like that. Snow makes me happy so I don't mind. Not even if I have to shovel. Where will you be headed to in April? 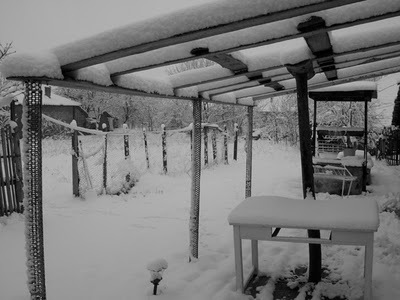 Yeah this picture was from today and tonight it is snowing again, looks like we will have double amount. My tentative plan in April is to check out Macedonian, and Serbia, and maybe search out some place to nest for a couple of months in Bosnia, and then head more north. It is a toss up. 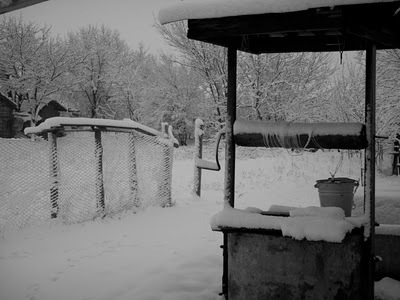 Next post: It’s Official, Winter Arrived In Bulgaria. Previous post: At Last, Old Man Winter.